A few days ago I was scrolling through good ol’ Pinterest when I came across a healthy alternative to a Sunday breakfast classic, Banana Pancakes! There were quite a few variations but I decided to do a blind run (on facebook live video no less) of this one. For those of you out there who are too lazy to click on a hyperlink for a recipe, I will write it on this post as well – or you can watch the video at the bottom of this page. It is a really simple base recipe that opens up to a wide variety of flavour combinations. I will admit that during my first attempt on a facebook live recording – I had slightly burnt the pancakes. Let this be a lesson in why you need to follow the temperature guide rather than winging it with a list of ingredients when it comes to cooking. The base recipe is fantastically simple but the type of protein powder you use can change the consistency drastically. I found the first attempt to be uncomfortably dense however with some tweaking (and not overcooking it) the results were fantastic! If you are looking for a fluffier texture then try adding a dash of self raising flour and pinch of baking soda (honestly, I eyeball everything when I start altering recipes but would estimate I added maybe 1/4 cup of Self Raising Flour). The brand of protein powder also drastically changes the texture and consistency, my ItWorks! protein shake only required 1 scoop however my fathers musashi mass building protein shake required 2 scoops. 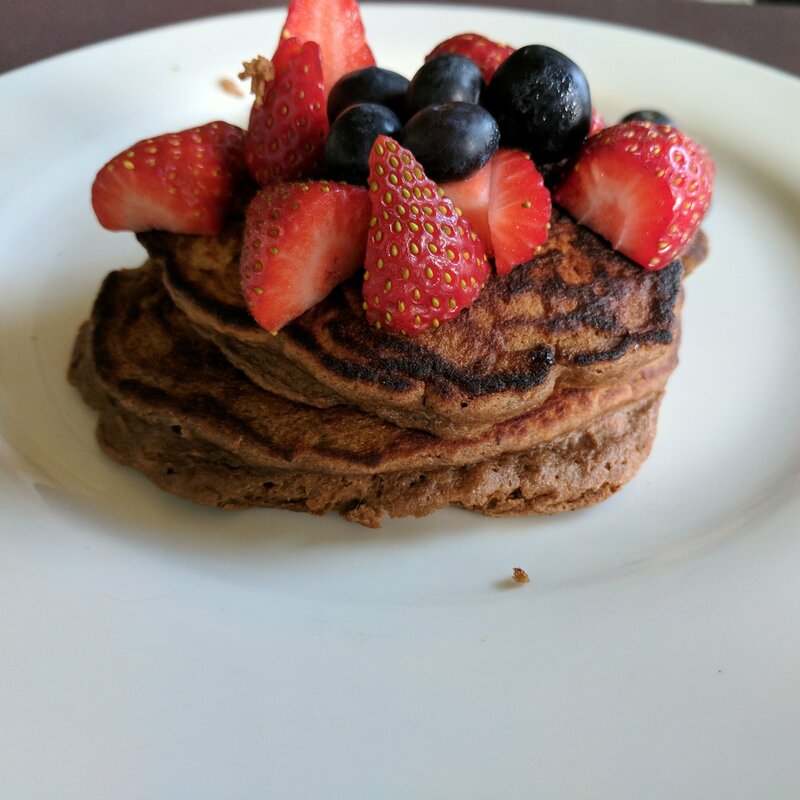 The banana flavour is very subtle when you use chocolate flavoured protein powders so if you are a fan of sweet breakfasts then you will definitely have to add honey for that traditional ‘pancake’ feel/taste. If you used vanilla protein powder then you could add your favorite fruits to the batter to create a wide variety of flavours. For the guys out there, you can change up this recipe to up your carbs but who can complain about having a tasty treat that is also giving them at least one serve of fruit?! For the parrots you could substitute the protein powder for almond meal or something similar to have a parrot friendly treat for your feathered friend! This will become a regular in my family and we loved it after tweaking the recipe. A must try!